The index opened strong above 7900 but saw profit booking to the lows of the day around 7843 within the first few minutes of trade. The responsive buyers took control from thereon and closed the index near the high at 7914.70, gain of 64.25 points. The broader market was strong with 886 advances to 684 declines. The range for series is at 7500-8000. 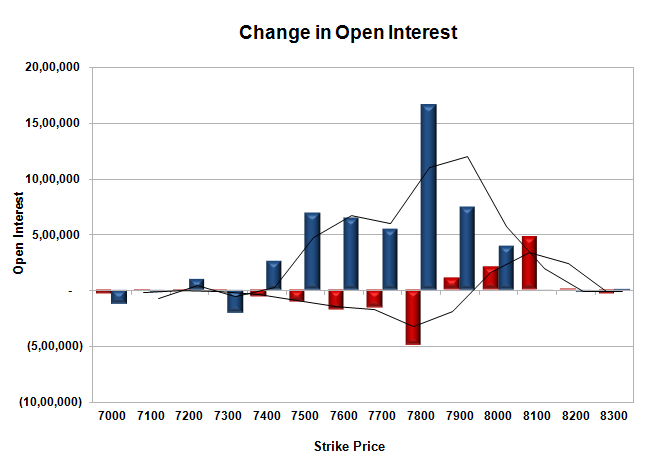 Call option 7900-8100 added 7.94 lacs OI with short covering seen at 7800 and below strike prices. Put option 8000-7400 added huge 49.56 lacs OI with profit booking seen at 7300 and below strike prices. 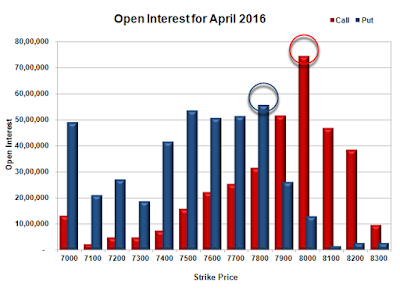 Nifty Open Interest is at 1,58,60,400 down by 3,55,050, with increase in price, most probably short covering. Bank Nifty Open Interest is at 16,73,190 down by 48,390, with decrease in price, most probably long liquidation. FII’s bought huge 10679 contracts of Index Futures, which includes net 3621 contracts long build-up and 7058 contracts short covering, with decrease in net OI by 3437 contracts, includes 40031 longs to 29352 shorts for the day. FII’s Index future open contract as on date is 155356 Longs to 86386 Shorts, Net 68970 up by 10679 contracts. 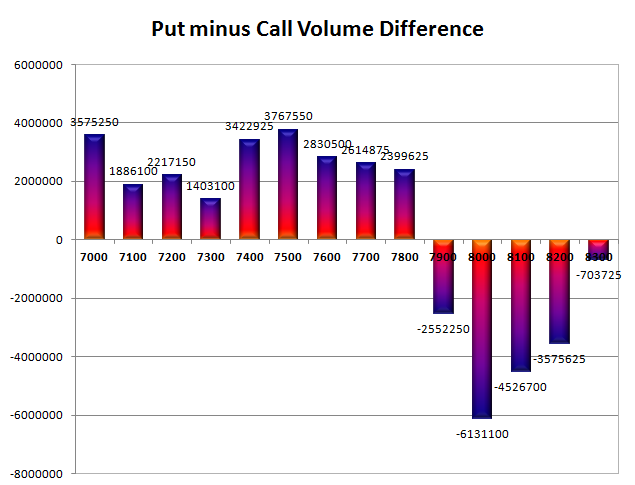 Initial and best support at 7800, with OI of 55.59 lacs and below that at 7700 with OI of 51.44 lacs. Initial and best resistance at 8000, with highest OI of 74.41 lacs and above that at 8100 with OI of 46.91 lacs. Day Range as per Option Table is 7827 - 7969 and as per VIX is 7844 - 7985 with 7893 as the Pivot.